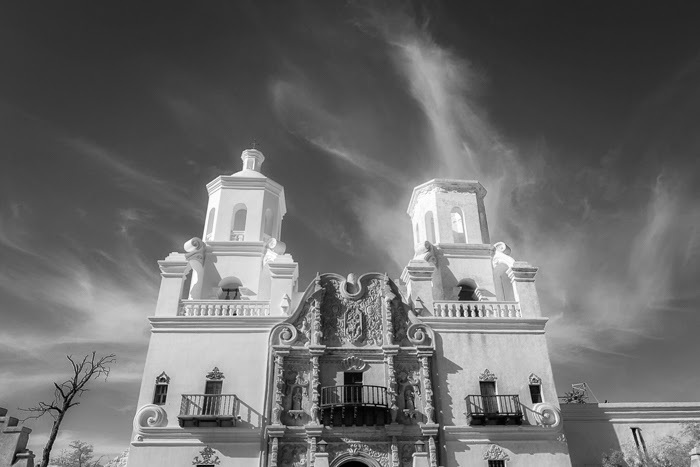 Mission San Xavier del Bac, Tucson, AZ. Canon 7D, Tokina 11-16mm f/2.8, ISO 100, f/8, 1/200 sec. 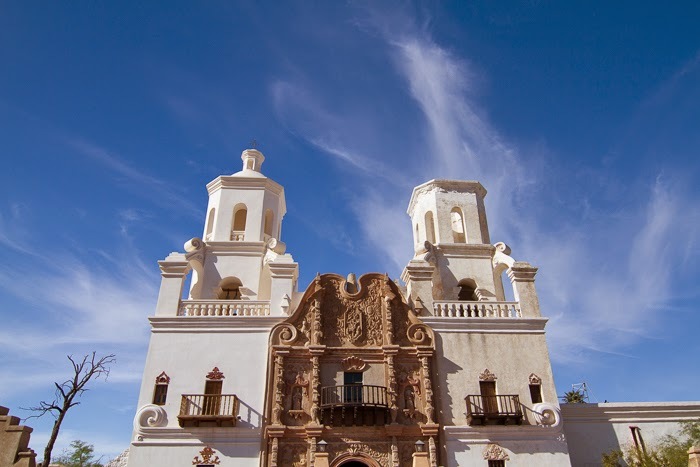 While we were in Tucson, we took an afternoon spin over to see the Mission San Xavier del Bac, a national historic landmark dating back to 1797. I wanted to share how, and why, I processed the shot above from the original out-of-camera image. The first thing I realized is that I was probably going to want to convert to black and white. First, the black and white treatment gave it more of a sense of timelessness and complimented the old architecture. Second, I wanted to be able to really emphasize the wispy cirrus clouds and I didn't like what was happening with the intense blue sky when I manipulated the color version. I sampled several black and white presets in Adobe Lightroom as jumping off points, and I think I tried the Infrared preset first. That was the preset I ended up choosing, as I liked the glow the faux infrared treatment gave to the building and the emphasis it gave to the wispy clouds. At first I increased the post-crop vignette to help focus the viewers eye and darken the sky, but it was a bit too overdone, so I backed it off until it was only slightly higher than the preset had originally applied. I also increased the exposure by 0.20 to bring out a bit more detail in the shadows and intensify the whites. Next I tweaked the blue slider in the Black and White Mix panel down -37 to darken the blue sky some more to really make the building and those cirrus clouds pop, but without going so far as to make the sky look too black. Finally I tuned down both the grain amount and roughness to the point where I thought the grain added a pleasing effect, without distracting too much from the overall photograph. Note that I did play with the perspective control in Lightroom, but I found that; a) correcting the keystone effect cropped too much off the sides and top of the image, removing important elements, and b) I liked how the keystone effect draws the viewer's eye towards the heavens and the wispy angelic clouds. In this case, the keystone effect adds to, rather than detracts from, the composition.